Protect both the top of your head and your face using the Spangenhelm with Face Guard. This historic helmet shape utilizes riveted segments and strips to create its round look while the face guard provides added defense to the piece. Small holes are punched in the face guard to allow ventilation without sacrificing security. 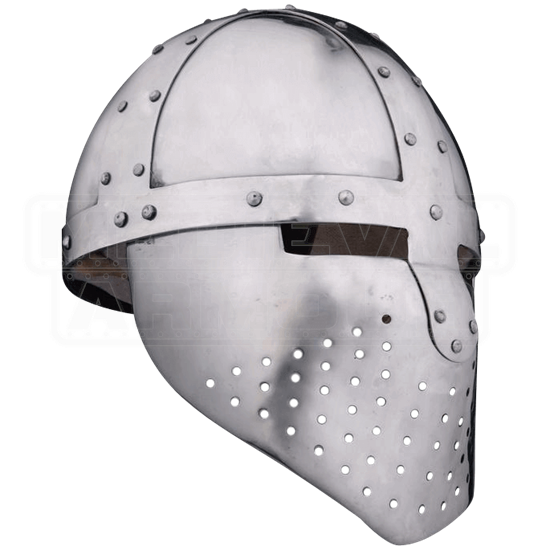 Made from 14 gauge steel, with slight variation due to its handmade construction, this helmet is a sturdy addition to any set of historic reenactment armour ensemble.